As a former military service member, there were days that I would be at work before 0530 and I thought that when I retired that it would have gotten easier. I thought that I would now be able to sleep in late until 10am or maybe even noon, or how about not get out of bed at all? Boy was I wrong! Life as a stay at home mom has been even harder than it was with me being in the US Army. I still most days get up at 0530 in the morning and most nights I don't go to bed until after 10pm. So what do I do all day long, and how do I keep my energy up having to take care of a home and a pre-schooler who seems to have energy abound? Well I indulge in the new SnackWell's Biscuit Thins. There is no doubt about it, I'm very much a morning person and my kids sometimes go crazy when I wake them up before 6am, especially during the summer. I just can't sleep in. The one thing I also can't do is live without my coffee. I just gotta have it! I'm however a morning grouch without it and my kids and husband can attest to that. I'm worse than a mama bear protecting her young, although my growl is much worse than my bite. 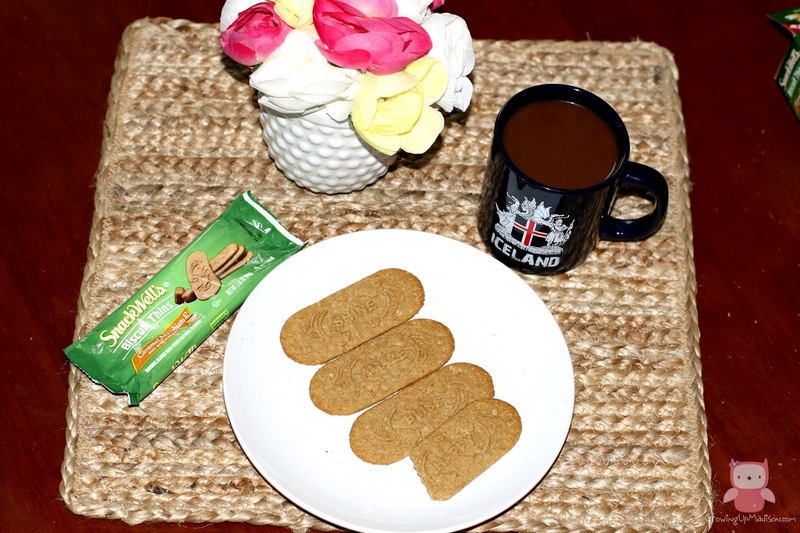 So I gotta have my coffee in the morning and preferably all throughout the day, that's why I'm so much in love with these new SnackWell's Biscuit Thins and I pick them up at my local Walmart. Not only are they a good source of protein and fiber since they are made with whole grains, I also receive 24g of whole grain per serving, but they are also made with real coffee. It's like me having my coffee without actually having my coffee. There are also three delicious flavors to choose from, so pick your poison as I like to say. 3. Dark Chocolate Mocha (if you love rich dark chocolate and mocha flavors combined with real coffee, then you'll love this). They are also fat free and contains 40% less sugar than the leading competitor. As most of you know I have a peanut allergy and these are peanut free, does not contain high fructose corn syrup or partially hydrogenated oil and they are USDA and School compliant. Not only are these a great pick me up in the morning, but they are also inspirational. Each SnackWell's Biscuit Thins comes with an inspirational word imprinted on your biscuit to make you feel so much better in the morning. Words such as Love, Amaze, Bliss, Happy and Shine. Won't you love to feel amazing about yourself knowing that you're going to shine. Oh, how happy and blissful you'll feel! No other morning biscuits make you feel this way! And if you don't have time to have breakfast, these are also good for on the go! Just keep a few in your bag for a quick and easy pick me up snack. 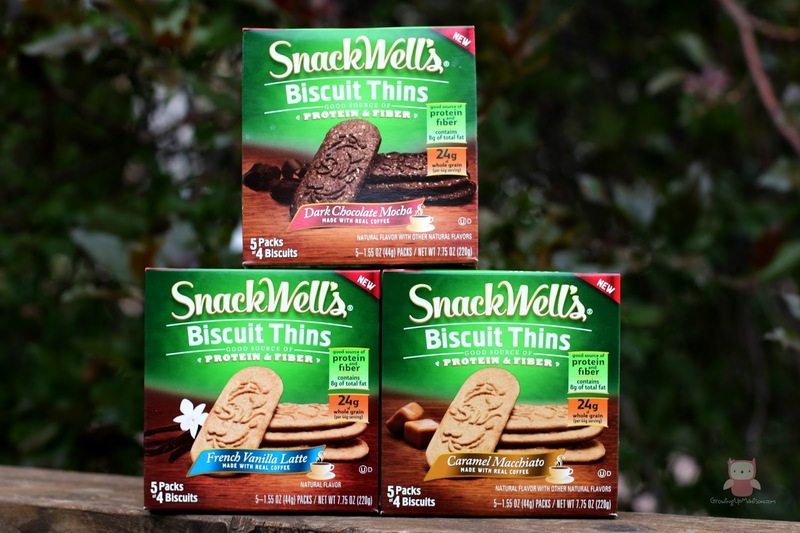 SnackWell believes that you should not only live well, but you should also snack well, so they make products that are better-for-you with cleaner ingredients and are family friendly and perfect for sharing. 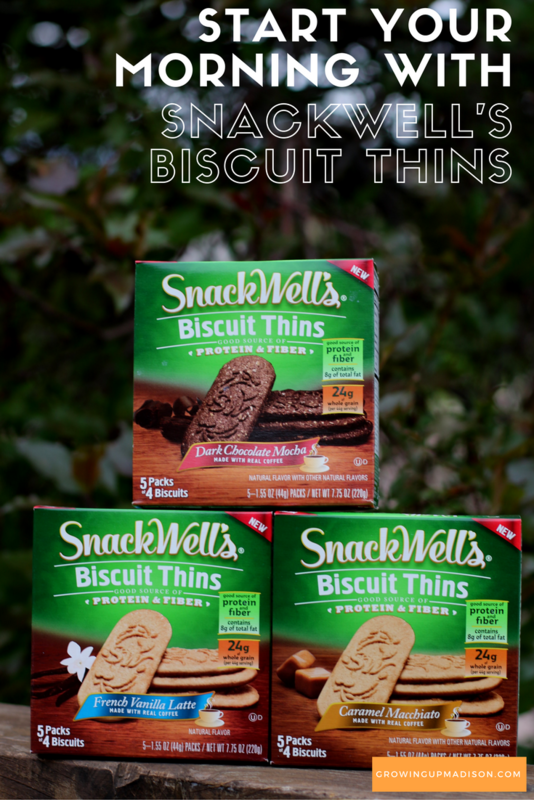 So give the new SnackWell's Biscuit Thins a try and use this $1.00 off coupon for some extra savings. Let's discuss: Which do you think will be your favorite? Wow, I haven't seen these in stores before. They sound yummy. I will have to look for them. You can find them in the cookie aisle of your local Walmart. That looks like an amazing breakfast! Anything that looks that much like a cookie and yet is good for me is a definite winner! It's a winner for me too! Love that these have cute messages on each one. I hate thinking about what to prepare for breakfast... here's a nice day off it for me. I really loved the inspirational messages too. They can truly make a bad day better. Wow, they look great! Each flavor even better than the rest. I am a big fan of protein and fiber when I travel so I buy these to have on the plane and in my hotel room. That's a great way to have them. On the go always works! I first had a snackwells item with coffee, and these would be so much better. Thins are crunchy and satisfying without being heavy. That is very true and these are amazing! These look like they make a great snack! I would probably really enjoy the dark chocolate mocha one. They were all really good and I loved the Dark Chocolate Mocha one too although I'm not a big fan of Dark Chocolate. I have always loved SnackWell's products and had no idea they were still around. 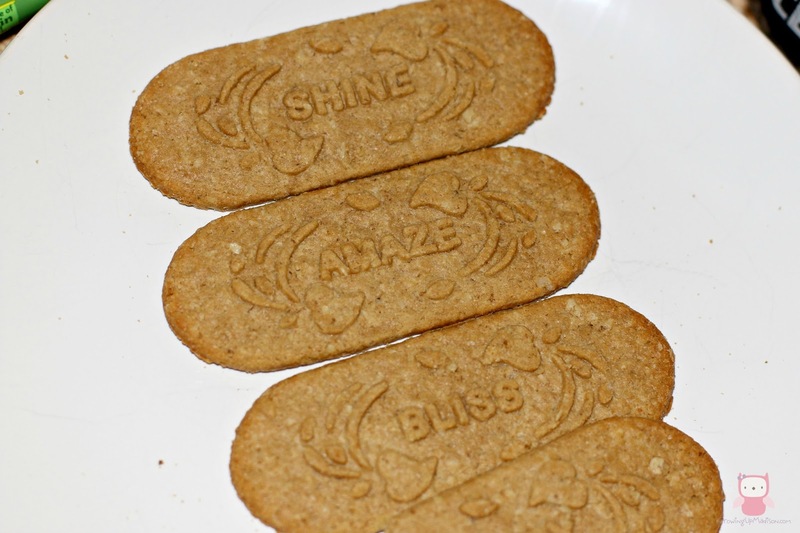 The inspirational words imprinted on the biscuits make these extra awesome! Yes they are very much still around and don't you just love those inspirational words? I'd love to to a couple of those flavors. I wonder which one I'd like best! You'd love them all but maybe French Vanilla? Ugh, mornings really are the worst! Though I'm finding myself to be a reluctant morning person as I seem to be more productive. Go figure! These look so good! Thank you for the coupon! You're very welcome Brandy. Enjoy! I love these biscuit thins, my favorite flavour is the Caramel Macchiato. I dip mine in my morning cup of coffee, it's so perfect! Snackwell is a great brand. i am so wanting to try the dark chocolate of course. they definitely make for a great snack break in mid afternoon when you have forgotten to eat lunch. They make a great snack at any time but as a pick me up when you've forgotten lunch, yes indeed! I am NOT a morning person. At all. I need my coffee as well, and I do love macchiatos. Oh I am very much a morning person. I think I sleep about 5hrs at night. I need to sleep more. I have not tried these yet. I bet they would taste really good with peanut butter on them and my mocha coffee! I haven't tried them with peanut butter but I'm pretty sure that they do. I think the messages on these biscuits are such a great idea and I've been loving all the flavors but being a chocoholic, it's the Dark Chocolate Mocha for me! I've enjoyed Snackwell's since I was little girl and to this day, I don't think they have a product on the shelf that I don't like. I'm so excited for these new biscuits. They are a great snack, perfect with morning coffee, great at the office.... cookies but not really cookies! I will be picking up a few more boxes this week to enjoy and thank you for sharing such a charming post! Love easy ways to get out the door faster in the mornings! Good snack, too. Oh they sure are a great snack! Aren't those amazing! I love them!! Wow, this is really nice. I think this is going to be on my fave list but I hope I can fin d it here in our country. I hope you can too! They're great! I am always looking for new breakfast and snack options. Thanks so much for sharing. You're very welcome Wendy and don't forget to use that coupon if you pick it up. Oh tough decide... but I bet I would love the French Vanilla. The others sound good though too. Maybe all of them? French Vanilla is great but I'm a sucker for anything caramel. You should definitely try them all. These cookies look so delicious. I would love to start with the Caramel Macchiato flavor. Oh you picked a great choice. Those are awesome! These look so good! I love the Snackwell brand and that protein would be an awesome way to start the day. Protein is always a great way to start the day and these are a great source of protein. Those look like they would go great with coffee. I'm a fan of Snackwells products so we will have to try these. Oh they go great with coffee. You'd love them. I may have to treaty the hubby with a SnackWells biscuit thins. And he will be getting an extra dose of fiber to boot! You got it! I'm pretty sure he'll love them and so would you. This is the first time I have heard of these. I'd like the dark chocolate. I'm happy I was able to introduce them to you. Dark Chocolate was good too. Oh this looks so lovely and perfect for the on the go mom. I'd totally grab one of these after my morning workout. And you'd have made a wise decision! 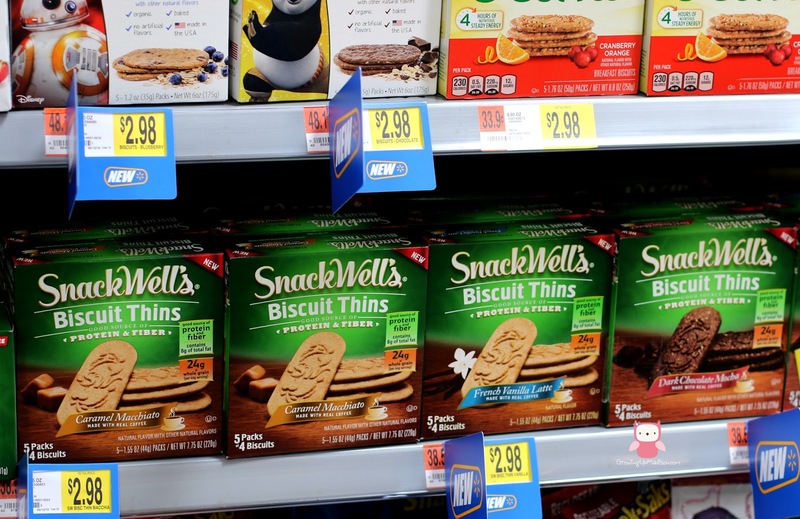 These snackwells biscuit thins look tasty! I'd love to try the Double Chocolate Mocha! You should most certainly try them. I think the dark chocolate mocha would be my fave. I have them in the cupboard but I haven't opened them yet. Oh Rosey, what are you waiting for? You should definitely open that box right away! These sound amazing! I am all about finding good snacks that fit in with my lifestyle. I am going to have to try these out. Oh you should certainly try them out. You're going to love them. The vanilla is delicious but so are all the other flavors. I love the embossed in this biscuit. My son will surely enjoy to eat these. That's one of the things I truly do love about these. They are a great inspiration in the morning. I couldn't imagine waking up so early. These bars would be the perfect go to for a quick and easy meal without cooking. Oh when you've been doing it for as long as me, you get accustomed to it. While you can give them to your kids, I personally prefer to eat them myself. Remember they do contain a tad of coffee so if you don't want your kids having the taste of coffee then you may not want to give it to them. These looks yummy! If I had to pick just one, I'd pick the French Vanilla Latte! French Vanilla Latte is awesome! You'd love it! This is something I need to do as I don't snack or eat well. Sometimes I am eating barely anything and other times I pig out because I am hungry all the time. It's certainly not a good idea to pig out. You might want to eat little meals throughout the day instead. I don't eat well at all as I have acid reflux. I pretty don't eat anything until dinner just to stave off symptoms. When I was pregnant I was like that. I've found that eating small portions helps. Love these biscuits in the morning with a cup of milk! Make my day so much brighter! That's certainly one good way to have them. These look good with a morning cup of coffee or even on the side with bacon and eggs! Yums! They're pretty amazing, you should give them a try. Loving the chocolate, and how cute are the words of inspiration!? I know right? They're right up my alley, I love getting my positive vibes in the morning with my breakfast. And you should. Thanks for stopping by. We're just now getting into our back to school routine. Hasn't been too terrible as long as I have my coffee! Coffee does seem to make everything so much better doesn't it? That did taste amazing but it wasn't my favorite but it can totally be yours! I am not a crazy breakfast person and so these would be perfect for me. I always get my day started so quickly I always forget. Oh you've got to remember breakfast. It is an important meal and one not to forget. I am loving that these are in chocolate flavors. These seriously look so delicious that I could eat the whole box. Oh while it's not recommended, you can do that because they're oh so good! Oh nothing to feel guilty about, they're really pretty good!